A product of ancient Mexican breeds, the Chihuahua is a small but proud breed of dog prized for it's companionship and affectionate nature. These are feisty, merry little dogs that love life and attack it with gusto. Body: The body is just slightly longer than it is tall, and it's compact. The topline is level, and the tail should be carried either sickle or curved over the back. Size: This dog should be well-balanced, and it should not exceed six pounds. Head: The head is this breed's most distinctive feature. The skull is well-rounded and is often described as an "apple head." The eyes are full and round, and they should convey a saucy expression. The ears should be large and held erect, and they should flare to the sides at about a 45 degree angle when the dog is relaxed. The muzzle is moderately short, and the stop is well-defined where the muzzle meets the head. The bite is either level or scissors, and bites that are overshot or undershot are considered a serious fault. Coat: Any color is permissable including solid colors, as well as dogs with marking or splashes. The Chihuahua, also known as a Chi, may be the smallest breed of dog, but it certainly packs a wallop in the personality department. Although many may still have that image of the trembling Chi so prevalent decades ago, today's Chihuahua is a different customer. Thanks to the wonderful work of responsible breeders, the Chi fancy has been able to greatly improve the temperament of this adorable breed. This member of the Toy group is more likely to be the King/Queen of all it surveys. They are quite robust and even Terrier-like in temperament, and full of self confidence. Of course, every dog is an individual, but overall, the improvement in personality has been amazing. It should be noted that while these dogs have a natural love for children, the tiny size of these dogs does not make them the best pets for young children. This breed is territorial, believing deeply in the pecking order, and will bully each other to establish their place in the order of dominance in their family group. Normally these issues resolve themselves, but if you find two of your pets are Alpha males/females, you'll likely have to resign yourself to keeping them separated. Training does seem to be the Chihuahua's one weak point. That's not to say they are not intelligent enough to learn, because they are. However, this animal is driven by strong territorial instincts. This results in wetting around the house to mark territory, and females seem to be no better than males in this respect. This means you must be absolutely diligent when commencing potty training, and be sure to thoroughly clean up any accidents so your pet isn't drawn back to that spot. Some owners find a litter box or Wee Wee Pads helpful. Chihuahuas do actually take well to obedience training, and can learn to follow commands given consistently. This may actually be of some help with the potty training issues many owners face. Agility training also seems to appeal to their mindset, and there is nothing so adorable as the sight of one of these little mighty mice racing around the course at full tilt. Grooming a pet Chihuahua is fairly straightforward. The breed comes in two varieties; Smooth Coat and Long Coat. The smooth coated variety is a breeze to bathe and dry, and even though the long coat carries more hair, it is still fairly easy to maintain as long as you take care to comb through the fringes and the skirt at the rear. You can bathe as often as once a week if you wish. Toe nails and ears do need to be checked more regularly on this breed. Since they do not spend the amount of time running around as other breeds, they don't have the opportunity to wear their nails down, so keep them clipped. Ears should be cleaned out twice a month with a cotton swab dipped in a little alcohol. In general, Chihuahuas are a healthy breed that often live 12 years or more, but there are a few health concerns to be aware of. A common hereditary condition, patella luxation is dislocation of the kneecap. Sometimes referred to as a floating patella or slipping kneecap, the problem occurs when the kneecap moves from its normal position causing the dog to limp. In most cases, surgery can correct the problem. A Chihuahua has a very small mouth often resulting in overcrowding of its teeth. When teeth are overcrowded, food is easily trapped between them causing tarter and plaque to build up. Sometimes teeth have to be removed or are lost at an early age. 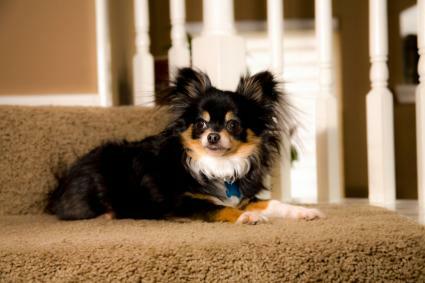 Another tooth problem that often occurs in Chihuahuas is the retention of puppy teeth. When this occurs, the adult tooth grows in next to the puppy tooth. 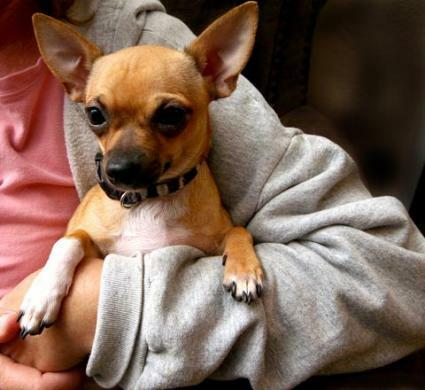 Hypoglycemia occurs when the blood sugar levels of a Chihuahua become extremely low. The low levels cause the dog's body to go into shock, generally referred to as sugar shock. When this occurs the dog becomes weak since the essential nutrients cannot reach its body and brain. Many dogs become very sleepy or show an extreme lack of energy. They may begin to shiver, exhibit a lack of muscle coordination and seem disoriented. The condition, if not treated properly, can result in seizures, coma and death. While puppies of most breeds are born with an opening in the bone at the top of their skull, it closes with maturity. According to the Chihuahua Club of America, the Chihuahua's opening, called the molera, may naturally remain open all of its life and is not a cause for alarm. This means that you will always need to have some care for your pet's head, but this almost never presents a problem unless the opening is unusually wide. An exceptionally wide molera at birth could be a sign of hydrocephalus (aka water on the brain), and though very rare, it's worth examination by a vet. Just note that the presence of a molera does not automatically mean a Chihuahua has hydrocephalus. This dog brought a great deal of attention to the breed, though it was not the best representative of the standard. However, a Chi is a Chi, and Gidget made her mark. Her influence was also felt at Chihuahua rescue programs across the nation, when hasty owners surrendered their pets after realizing the amount of attention the breed requires. If you are looking for a highly intelligent little dog that is loyal and loving, a Chihuahua may be the perfect choice for you. Visit reputable breeders and breed rescues in person and get a sense of the Chihuahua's personality by spending time with them. Whether you adopt an adult dog from a shelter or choose a puppy from a breeder, you will be familiar with the personality and needs of your new canine companion.